Does your business have people who are willing to talk about you and your business? Business thrive when people talk about your business in a positive light, in fact, it is free advertising! People who advertise your business and services are a valuable asset to your business health and growth! GBR4U uses a “Word of Mouth” marketing concept that does exactly that. We Brand your Business verbally! The more people that talk positively about your business the better! Fellow Pioneer Virtual Business Mall members talk and advertise your business using the information you share with them during your Infomercial when branding your business! Remember, life is strange… when a person who is not attached or involved with your business talks and brands you then they are deemed more Credible and seen as less Biased about your business! After all, they have no Financial Gain to be made, people know and understand that! Business Networking using a Word of Mouth strategy builds Credibility about You as well as Your Business before you have even met the prospective client! That makes the actual contact with the prospective client so much easier as they are already expecting your call! A Valuable Business Referral then puts you in front of a person that needs your services! It basically opens the door for you to people that need you! Referrals are unfortunately not guaranteed and your normal expertise will still be necessary to conclude the business. Word of Mouth is one of the most cost-effective types of advertising a business can have. This is directly linked to the fact that People Trust People, making it one of the most Powerful Business Advertising methods that exist. Our groups are all named Pioneers and are identified in numerical order i.e Pioneer 1, Pioneer 2 and so on. We refer to each Pioneer Group as a virtual business mall due to all the various business owners present. Our business model is based on the basic principle of "What You Sow, So Shall You Reap". This means, the more business referrals you pass on to fellow Pioneer members, the more business referrals you will receive in return! 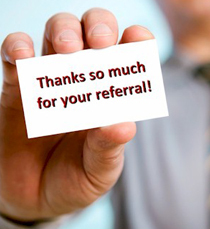 Keeping your ears to the ground and helping fellow members with Valuable Business Referrals ensures that you will too receive Valuable business referrals! The Law of Recipocation takes care of that! Many new members are concerned about how to source referrals. Referrals will start as your eyes & ears "tune in" to the amount of business happening around you which you then can refer. Our Success Plan Orientation (OSPO) will also assist you in recognizing the business referrals you can source for fellow Pioneer Members. Our weekly business referral meetings are aimed towards helping you grow your business with valuable business referrals! Regular Attendance and Participation at weekly meetings are of utmost importance. After all, how can your fellow business members get to know you as well as your business if you are not present to educate us on what business referrals you want? There is also the age old saying of "Out of Sight, Out of Mind". Each Pioneer group allows only one primary profession, therefore in becoming a member of a specific Pioneer Group, you are able to block out your opposition! In effect this means there is no business opposition within your specific Pioneer Group. This allows you to brand your business without the fear of educationg your opposition! A small amount of business overlapping may however occur as the concentration is on your core business. Enjoy increased Business Profits through valuable Business Referrals received from your fellow members. In Group meetings you are given referrals that will open a door to "the correct person" requiring your services, which creates a "willing buyer" and "willing seller" situation. Remember that successful business transactions originating from referrals received in your group are not guaranteed and will depend largely upon your busines expertise. Each Pioneer Group is Managed by a Group of Directors (not to be confused with GBR4U (Pty) Ltd Company Directors). Due to Innovative thinking and to ensure fresh ideas (which are always at the forefront of our organisation) we regularly change our Pioneer Group Directors. This also brings forth an active participation of our members within each Pioneer Group.